Long commutes to and from work, on top of long hours at work, are part of why many Americans are dissatisfied with their employment situations, studies have shown. One found that adding just 20 minutes to your commute could make you as unhappy as taking a 19 percent pay cut. Another found that 23 percent of workers have quit a job because of a bad commute. 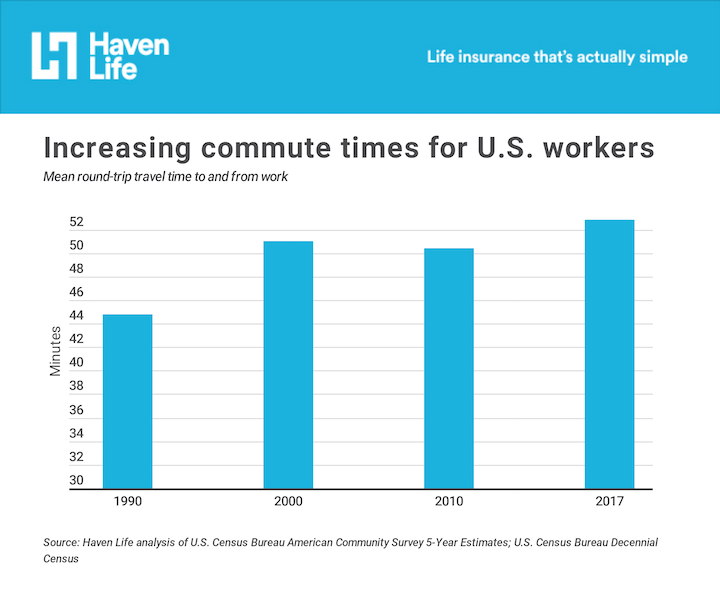 To find where workers are spending the most time in transit, online life-insurance agency Haven Life, using data from the U.S. Census Bureau, “calculated the average round-trip commute time and other statistics about its residents’ journey to work,” such as the ratio of working hours to commuting hours and the percentage of workers commuting over two hours a day. Some super-commuters make a conscious choice to live far afield so that they can get more space for their money. Danny Finlay, a 30-year-old PR representative in San Francisco, travels four hours and 140 miles every day from Dixon, California, so he can live in a three-bedroom home with a swimming pool. He estimates that he saves around $15,000 to $18,000 per year by not living in the Bay Area. Other workers with lengthy commutes, though, are just doing what they must, living far from their jobs because exurbs or outer boroughs are all they can afford. Sydney Bennet, a senior research associate at Apartment List, explains that many jobs are concentrated in cities where high housing costs can push workers further and further out, particularly in pricey places like California and New York.